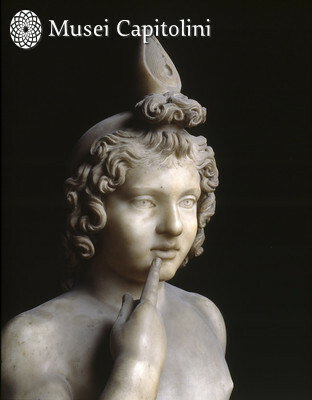 The young god Harpocrates , son of Isis and Osiris, is represented totally naked in the typical gesture of silence, with the index finger to his lips. The gesture may allude to the mystic and secret character of the Isiac religion, the rituals of which could only be revealed to those already initiated. The figure rests his weight on his right leg, his left is slightly withdrawn and held to the side with a movement that impacts the position of his pelvis and torso. His left hand, slightly apart from the body, holds a horn. His face is dominated by widely-cut eyes (with carved irises and pupils) and softly modeled features proper of a young god. A lotus flower rises on his hair on top of a small toupet on the forehead (creating the appearance of a pschent, the double crown of Lower and Upper Egypt). His hair is arranged in soft curly waves and frames his face. The sculpture was found in a room in the substructures of the Pecile of Villa Adriana at Tivoli in 1741 and was donated to the Capitoline collections by Benedetto XIV in 1744. The work dates to the Hadrianic period.